Year At Hawk Run Hollow [J1093] - $32.00 : Yarn Tree, Your wholesale source for cross stitch supplies. Cross stitch pattern by Carriage House Samplings. A block for each month featuring a scene from Hawk Run Hollow. 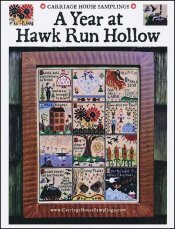 The ninth design in the Hawk Run Hollow series. Stitch count 278 wide x 371 high.